The Lodge was consecrated on 4th July 1956. 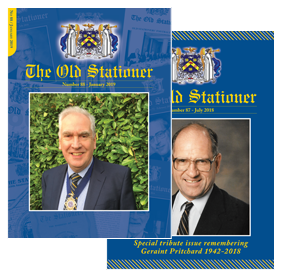 Here is an extract from "The Stationers Magazine" of July 1956..
"July 4th marked a great day in the history of the School, the Association and the Company when the Stationers' Company's School Lodge No. 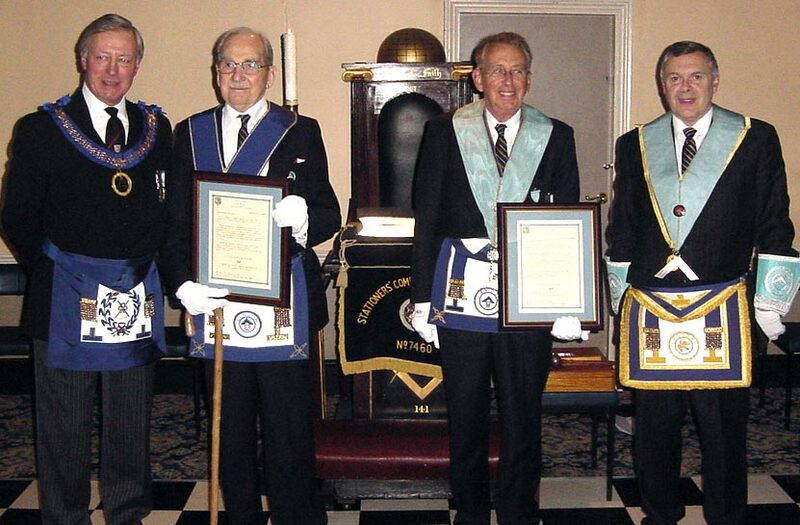 7460 was consecrated by R. W. Bro. Sir Sydney White K.C.V.O.. Grand Secretary, assisted by R. W. Bro. Maj. Gen. Rt. Hon. Lord Burnham C.B., D.S.O., M.C., T.D., D.L. and V. W. Bro. Sir Cullum Welch O.B.E. and other Officers of the Grand Lodge at Freemasons' Hall, London. Some 180 brethren attended the Ceremony. The Lodge was founded by seventeen Old Boys: the principal officers being Leslie H. Adams (Master), F. Lynne Pascoe and Wm. J. Kitching. The Lodge was sponsored by brethren of the Old Owens Lodge No. 4440. Dinner at the Connaught Rooms was attended by 130 brethren of whom many were of other Old Boys' Lodges, members of the Court of the Stationers' and Newspaper Makers' Company and other Livery Companies, Old Stationers in other Lodges and visiting brethren." '7460' is a London Lodge which meets at Mark Masons Hall, 86 St James Street, London SW1A 1PL, 4 times a year on a Friday. Meetings generally start around 5.00pm, & the Brethren dine together afterwards at 'Festive Board', so we are usually away by 9.00pm. Both Norman Bennett & John Wilkins had just celebrated being Masons for over 50 years when Metropolitan Grand Inspector Simon Dixon attended our Lodge's regular meeting on 3rd April 2009 to present each of them with a personal certificate from the Metropolitan Grand Master, in recognition of their milestone achievement. The Brethren of the Lodge showed appreciation of the sterling service both had given by presenting John with a gold 'Cross' pen (at the December 2008 meeting) & Norman with two engraved lead crystal glasses shortly after they had both received their certificates. The photograph below shows (from left to right) MetGInsp Simon Dixon, Norman Bennett (who has sadly died since then), John Wilkins (now aged 82) & WM David Hudson.